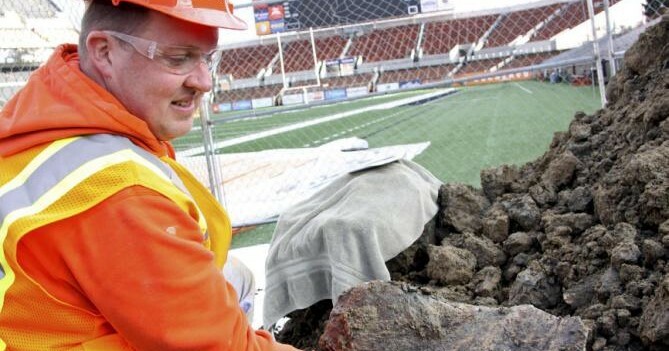 A 5-foot-long femur bone from an ice age mammoth, along with other bones from several other extinct mammals, were unearthed by a construction crew beneath the north end zone of Reser Stadium, Oregon State University’s football stadium on Monday last week, Jan. 25. According to Tim Sissel, senior project manager for Hunt/Fortis, the general contractor on the Valley Football Center Expansion and Renovation project, the initial discovery of the large femur bone was made by a worker digging in the area, prompting them to suspend activities at the site and to notify university officials about the important find. Large piles of dirt from the construction site were also set aside for excavation. The OSU called in experts to examine the bones and the site, notably including associate professor of anthropology Loren Davis who told reporters that the animals do not appear to have been killed. Davis said the mammoth’s bones along with those of a bison and some kind of camel or horse were discovered in a 10-foot deep plot in an area that could once have been a bog or marsh. “Animals who were sick would often go to a body of water and die there, so it’s not unusual to find a group of bones like this,” he explained. The newly discovered bones are at least 10,000 years old according to Davis. A more precise aging can be determined later after they have used radio carbon dating technology on the bones. He said there are no signs of human bones or artifacts at the site so the place where the mammoth bones were found are not considered part of a protected archaeological site. He said there are no special rules or regulations in Oregon governing the preservation or protection of paleontology finds. According to him, he and his students will continue excavating the large piles of dirt pulled from the site where more bones are believed to be buried. Meanwhile, the Hunt/Fortis crews have moved to other areas of the construction project while Davis and the other experts take a closer look at the fossil find. According to the contractor, the delay has been minimal so far and that they are still on schedule. Work on the Reser Stadium expansion began on November last year right after the home season finale. As planned, the locker room expansion and the Level 1-3 renovation should already be ready by August 2016. Also, the newly renovated main entrance to Valley Football Center should complete by November this year, in time for the start of the 2016-2017 football season. The Reser Stadium, located on the southwest corner of the Oregon State campus at the intersection of SW 26th Street and SW Western Boulevard in Corvallis, is the home of the Oregon State Beavers. The OSU varsity colors are Black and Orange. The university’s official mascot is Benny Beaver.